← Going, going . . . almost gone. I’m heading for the Wigglybus when a flowerpot man walks by. He’s very smart in a gray suit and red tie, with his folded umbrella. His gloves are green, which I suppose is appropriate for a flowerpot man. A lady says she thinks he has something to do with an upcoming flower festival, but he doesn’t speak, or carry a sign, so that’s guesswork. This is England, my dears. This is the market square in Devizes, near the Market Cross. Tiff Banks came here in Demon on a Distant Shore. Like Tiff, I’ve also been to Pewsey where the statue of King Alfred resides and Tiff met Constables Pickins and Fowler in the police station. I went to the pub which was a model for The Ugly Duck, where I had yummy steak and kidney pudding for lunch. I had faggots in gravy for dinner the other night. Both food items turned Tiff’s stomach just to read them on a menu. I shopped in the little L-shaped grocery shop where Tiff had a run-in with Royal’s ex-girlfriend. And, of course, I went along Church Lane to Saint Matthew’s Church, where my dad’s ashes are buried. Saint Matthew’s was the model for Saint Thomas, where Tiff met three dead people in the crypt. Am I following Tiff’s trail, or did she follow mine? What, you are asking, is a Wigglybus? Unfortunately it’s not officially called the Wigglybus anymore. 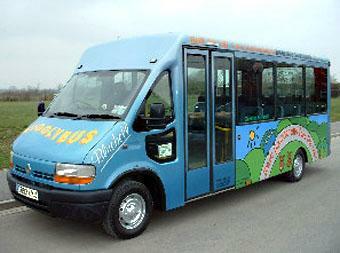 The government-funded Wigglybus service, created in 1999 to provide transportation to scattered villages in the Pewsey Vale area which had no public transportation, was take over by Wiltshire County Council in 2012 and renamed Connect2Wiltshire. So the buses no longer sport “Wigglybus” on the sides and the bright colors are gone, but the service is the same and I’ll continue to call it Wigglybus. It’s marvelous, really. Passengers call the bus service at least an hour before they need a ride, reserve a seat, and the bus picks them up at their home or nearby. If not for the Wigglybus – sorry, Connect2Wiltshire – my 90 year old almost-blind mum would never get to go anywhere. Riding the Wigglybus reminds me of Tiff’s reaction to driving on the narrow country lanes in Wiltshire. I tell you, those bus drivers should get medals. Gold plated medals. Awarded by the Queen. They way they “wiggle” those buses around the lanes, past other vehicles, at something approaching light-speed, is nothing short of miraculous. All the little old ladies and little old men take it in their stride, while visitors from the United States cling to anything available. Husband and I come to England every other year, and this year we celebrated my mum’s 90th birthday with a party at the village hall. After bemoaning the fact her grandsons couldn’t come, she was surprised and delighted when they walked into the cottage. She had not seen them for over ten years. Getting them here without her knowledge took some maneuvering and out-and-out lying so as not to ruin the surprise. We had to drop them off at my sister’s place where they stayed until the great day, then put them in a lovely bed and breakfast for two nights – Mum’s cottage is too small to accommodate more than two visitors. They then went to London and stayed with their cousin. Only seven days here, but sadly, they couldn’t get more time off work. Anyway, Mum was pleased as punch. The best birthday present, ever, she said. Next week we’re off to my sister’s house for a few days. My friend Carol is coming down from London while we’re there. Carol kindly allowed me to use her caricature for the ghost Carrie in Demon on a Distant Shore. Why do I keep getting the feeling Tiff Banks is looking over my shoulder? This entry was posted in Ramblings and tagged Demon on a Distant Shore, England, Family, Linda Welch, Tiff Banks, Whisperings, Whisperings novels. Bookmark the permalink. 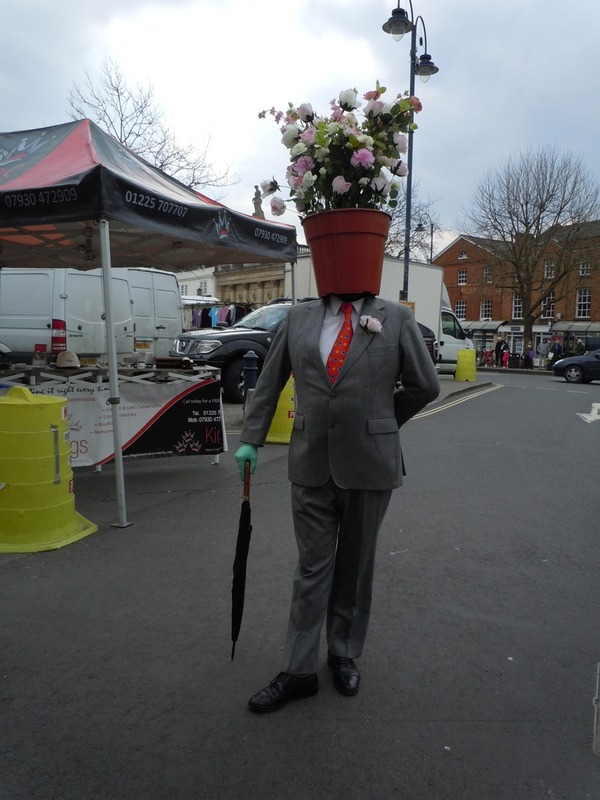 “Flowerpot Men” only reminded me of that old song, “Let’s go to San Francisco” – but that picture looks weird. Is that the proper male apparel for Ascot? Nothing to do with Ascot, Val. Ladies at Ascot wear peculiar hats, but not the men. I forgot about that song! No, nothing at all like you. Wink wink nudge nudge. I am glad your mom had a wonderful birthday celebration. I couldn’t think of any better footsteps to follow in than Tiff Banks. 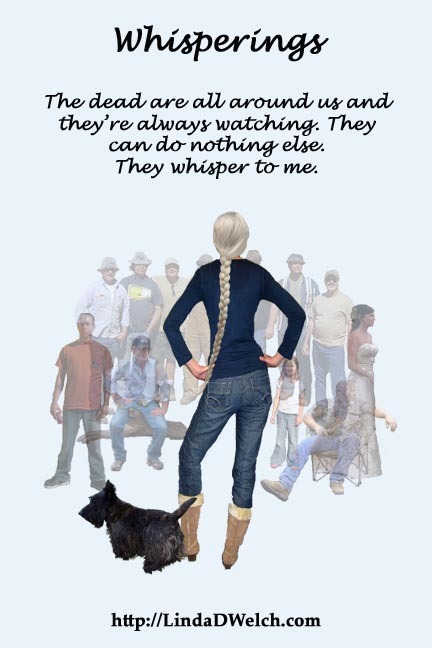 I also hope she may be looking over your shoulder and whispering in your ear that her stories have not all been told yet. Those books gave me such enjoyment and the characters became like family to me. Dean Koontz writes a series of books about Odd Thomas that I also love and I think he has a new once coming out soon so I guess I have something book wise to look forward to. I purchased another of your books but I could not seem to get into it. So I will be keeping my eye on you to see if you put out another Demon book. Enjoy the rest of your vacation. Tell Tiff hello for me if you should run into her over there!! After I published Along Came a Demon, someone mentioned Dean Koontz’ Odd Thomas and that it has a similar theme. I hadn’t heard of it, and decided not to read it so it didn’t influence what I wrote in the Whisperings series. You must have (tried to) read Femme Fatales, which is a very different style and not everyone’s “cup of tea,” especially if they are firm fans of Whisperings. You make me chuckle with your hints about another Whisperings book!!! I don’t know about Tiff Banks, but I am looking over your shoulder missus. I’m SO looking forward to it, Carrie. I mean Carol. I’ll try to get another post up before I leave, Sharon.